Thai Fight marks its tenth anniversary on March 30 with the event held in Nakhon Si Thammarat, Thailand. Established in 2010, the organisation has held two seasons of knockout tournaments featuring the likes of Fabio Pinca and Buakaw Banchamek, just to name a couple, followed by a series of events produced across the world with the A-list Thai fighters battling it out against international competitors. Next Saturday the promotion visits Nakhon Si Thammarat, southern city of Thailand. The event is dedicated “to celebrate the great 10th year of Thai Fight and to promote Thailand’s tourism,” (via Facebook). Famed Saenchai is scheduled to headline the upcoming show, which is his second outing in one month. 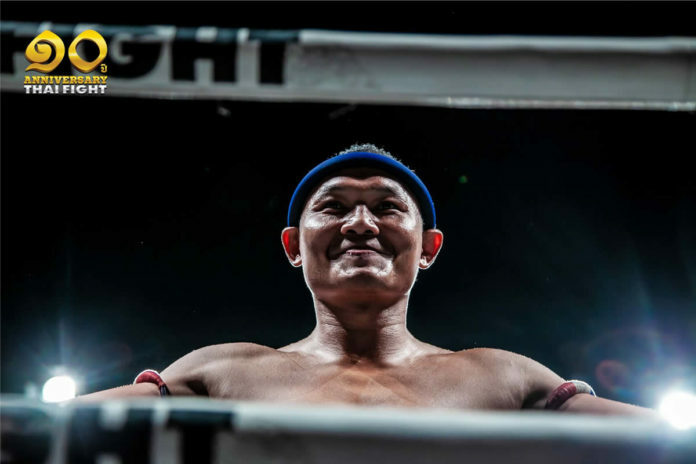 Early March the four-division Lumpinee Boxing Stadium champion traveled to the UAE where he earned a unanimous decision against Valerii Abramenko in the main event of “Fight Night Dubai”. Such Thai fighters as Tengnueng Sitjesairoong, PTT Sor.Pattanagas, Saensatharn, Chanajon, Payak and Petch Samui, Kitti Sor Jor Danrayong and Samingdej are also scheduled for “Thai Fight Nakhon Si Thammarat”. The name of fighter going up against Saenchai as well as other matchups are expected to be announced in the coming days.